By Dean Schwartz (SWAG Master): Not all branding and marketing companies can do international shipping, but SOBO can! International shipping can create a host of challenges for any business. Between high costs, legislative restrictions and unreliable service many businesses shy away from international shipping. But with SOBO’s worldwide network of production facilities, you can ship any product nearly anywhere in the world. Take a look at this case study. 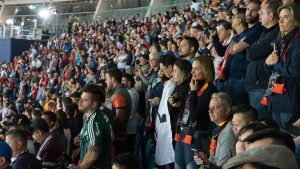 The Champion’s League final is a huge event that draws millions of viewers worldwide. 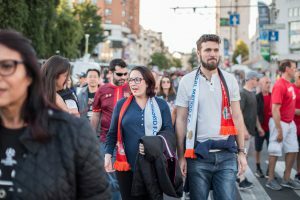 Soccer scarves are wildly popular at these events, and they are a great way for fans to show their support for either club. Not to mention they are a great branding opportunity! A long-time SOBO client, asked if we could design, produce and deliver soccer scarves to Kiev, Ukraine for this year’s final. 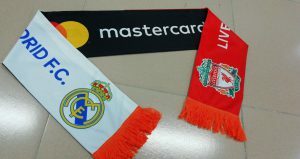 The scarves were for MasterCard VIP clients that they were entertaining at the match, which was between Liverpool and Real Madrid. Not only that, they needed the scarves delivered in 2 weeks! That is a tight turnaround, but we love a challenge. Our creative team got right to work. 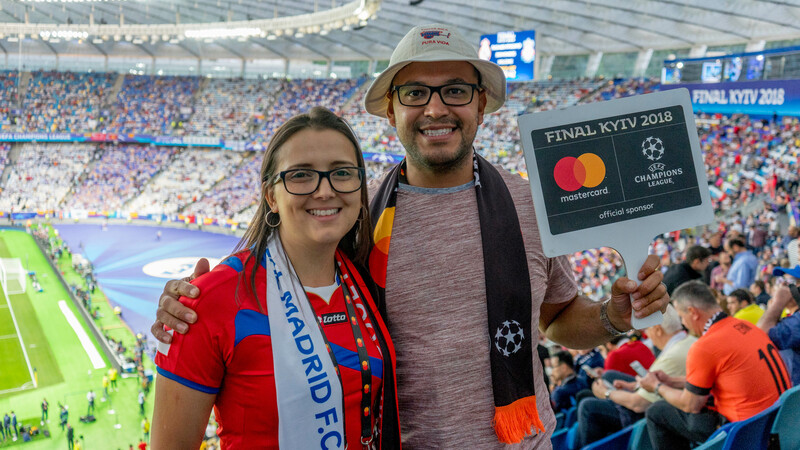 We designed a scarf featuring the logos for both teams on one side, and the MasterCard logo on the other. This was the perfect SWAG item for the event. See for yourself, check out the pictures below. But the biggest challenge was getting the scarves to Kiev on-time for the match. SOBO answered the call. Not only did we get the products delivered halfway across the world on-time, we took care of door-to-door deliver directly to their hotel. What can I say? We love to make our clients happy! Whether you require international shipping service, or you are just delivering down the street, SOBO has the solution. Get ready to open up your brand to the world! Give SOBO a call 888.752.0432 or email info@soboconcepts.com to get started. SWAG with style!